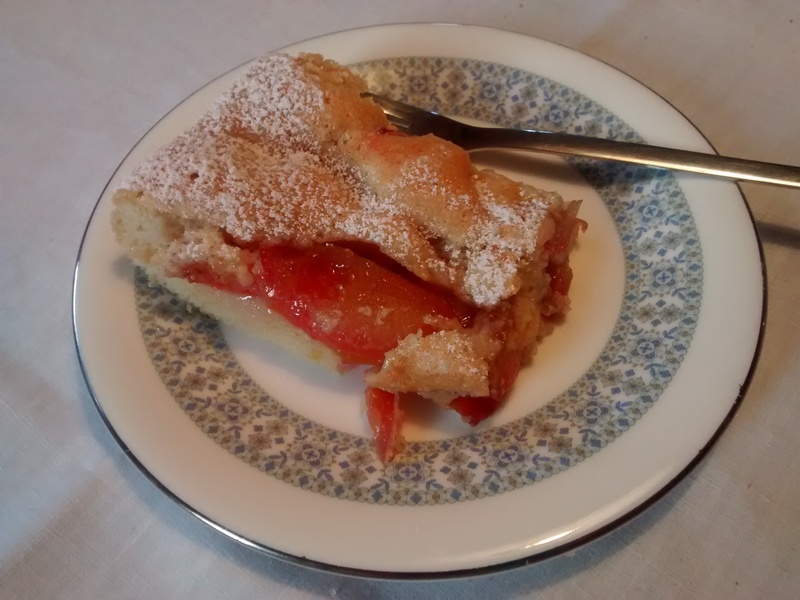 I have very fond memories of the first time I tasted this cake, it was a very warm, late summer’s day in the land of a thousand lakes in North East Poland – the Mazurian Lakes. 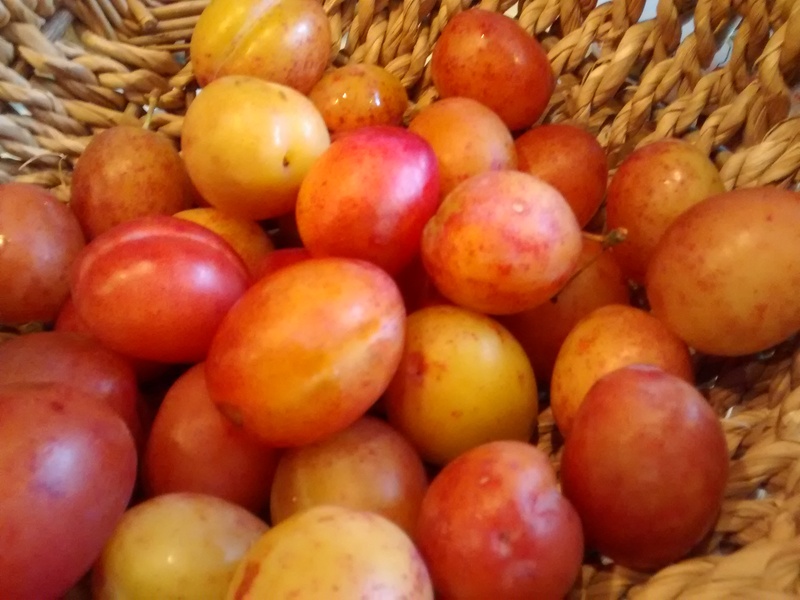 My cousin Krystyna went outside and came back in with one basket of eggs she had collected and another of ripe plums from one of the trees outside. 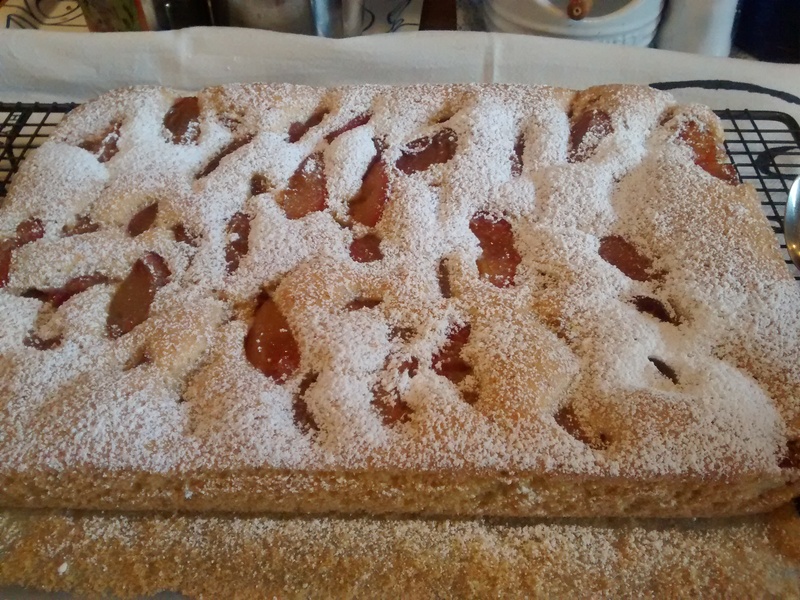 We set to and made this cake to her recipe, calling in the other cousins to eat it as soon as it was cool enough! 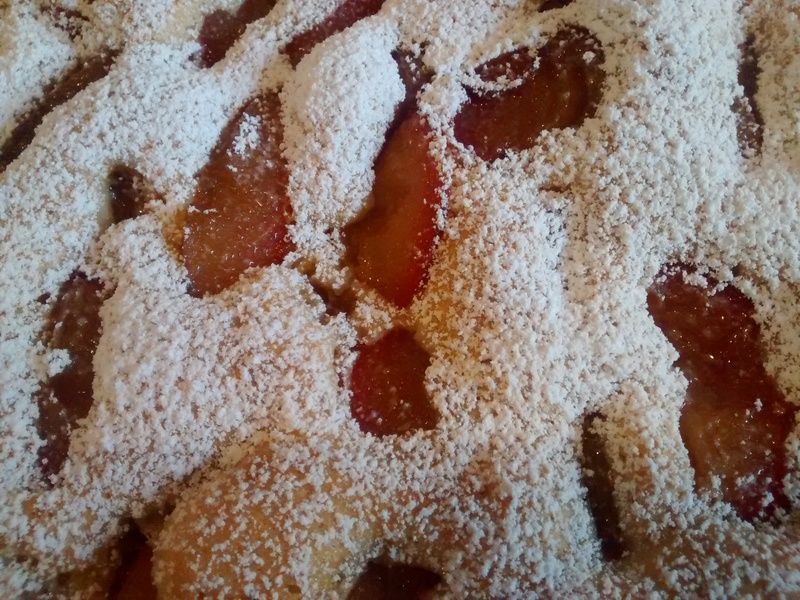 The contrasts between the texture of the cake and cooked plums and also the sweetness of the cake and the slight tartness of the plums make this a cake to remember. The use of oil means this is a relevantly modern recipe & it is so easy to make. The original recipe was made using metric cups but I have converted it to weights as I am happier using these. 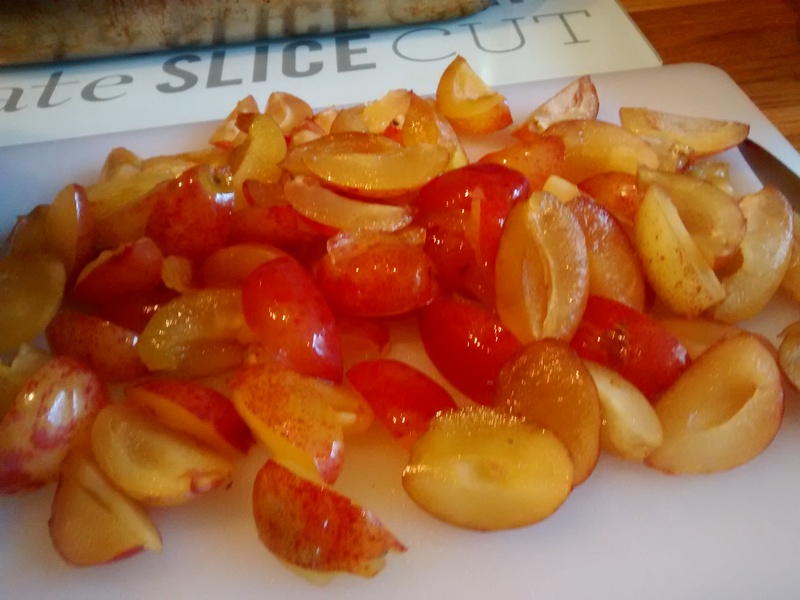 I make this using Victoria Plums. 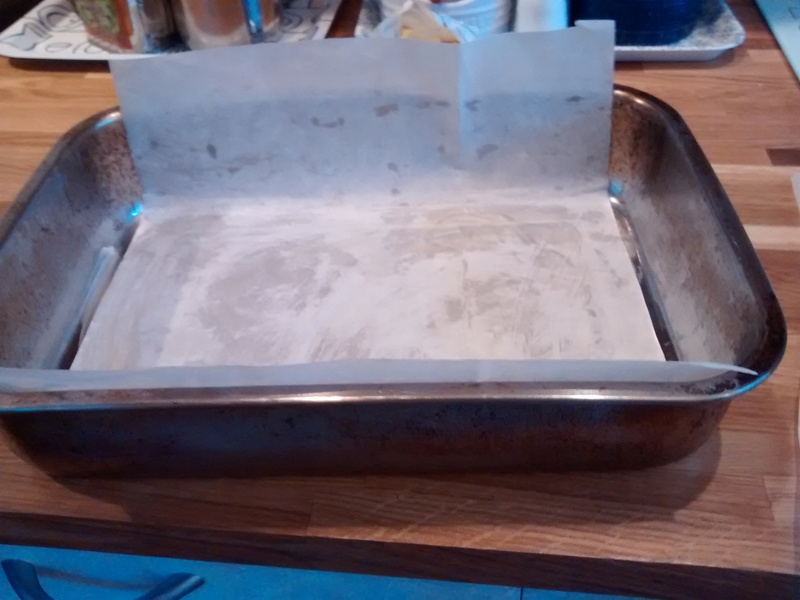 Take a roasting tin around 22cm by 31 cm and use one piece of greaseproof paper to line the 2 long sides and the base. 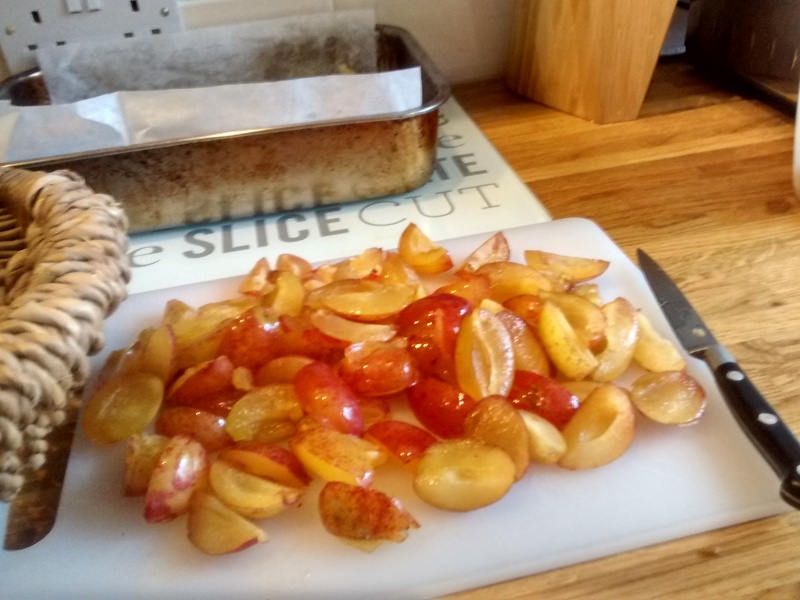 Cut the plums into quarters and take out the stones. 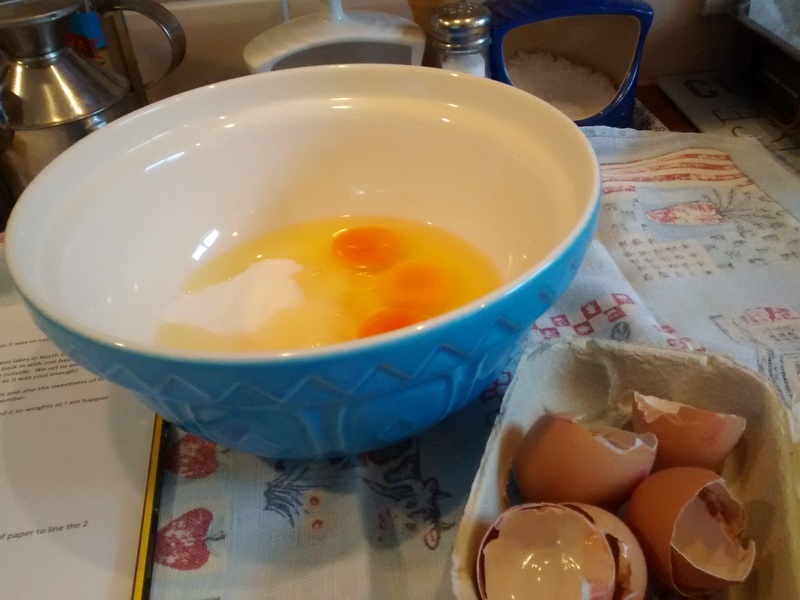 Whisk the eggs and sugar until the mixture is thick and creamy. 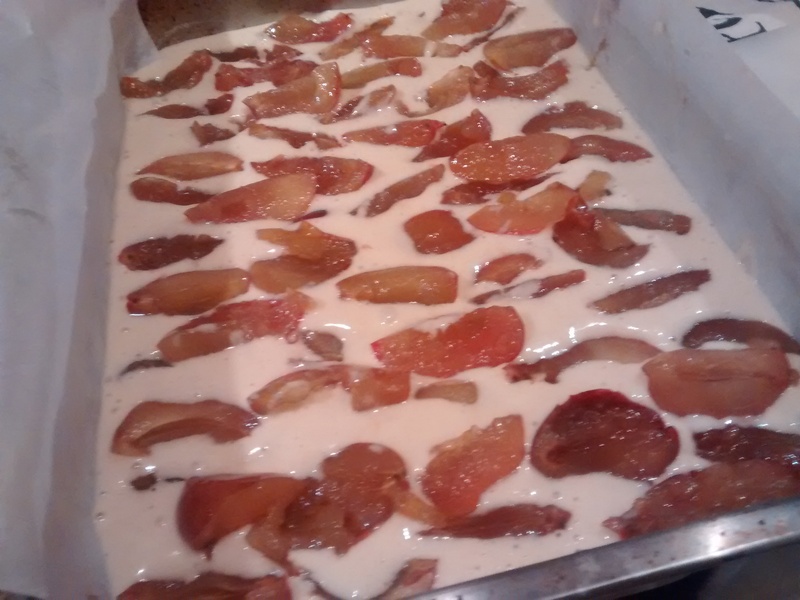 Add the oil and the flour and lightly beat everything together to make a thick batter. 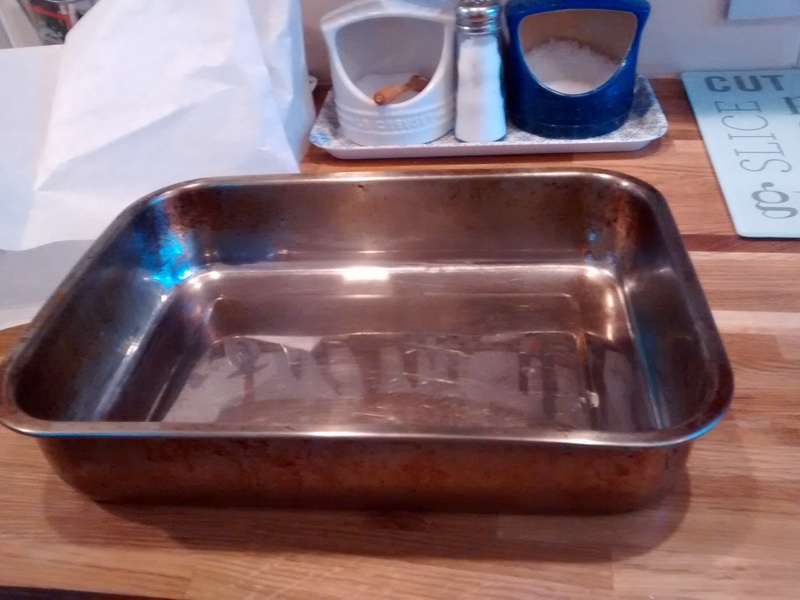 Pour the batter into the roasting tin. 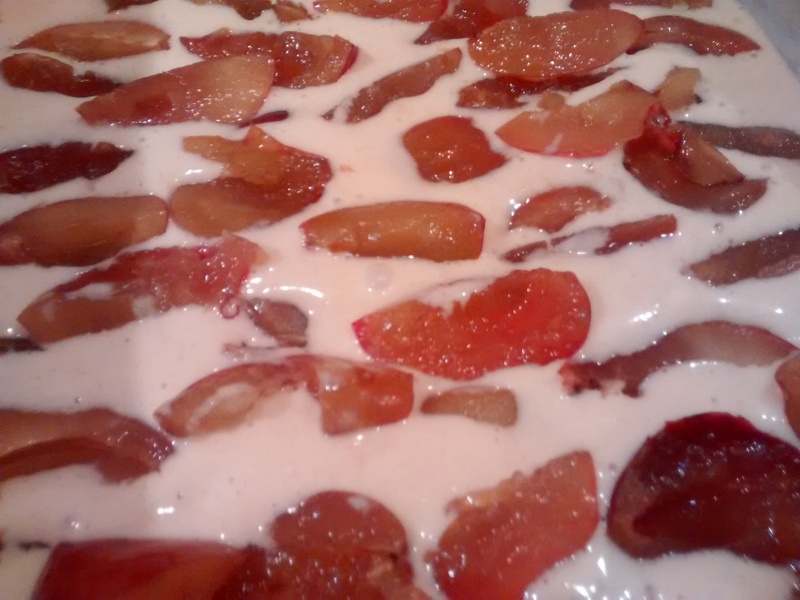 Place the cut plums, skin side down in rows on the batter until the top is full – they will start to sink – do not worry. 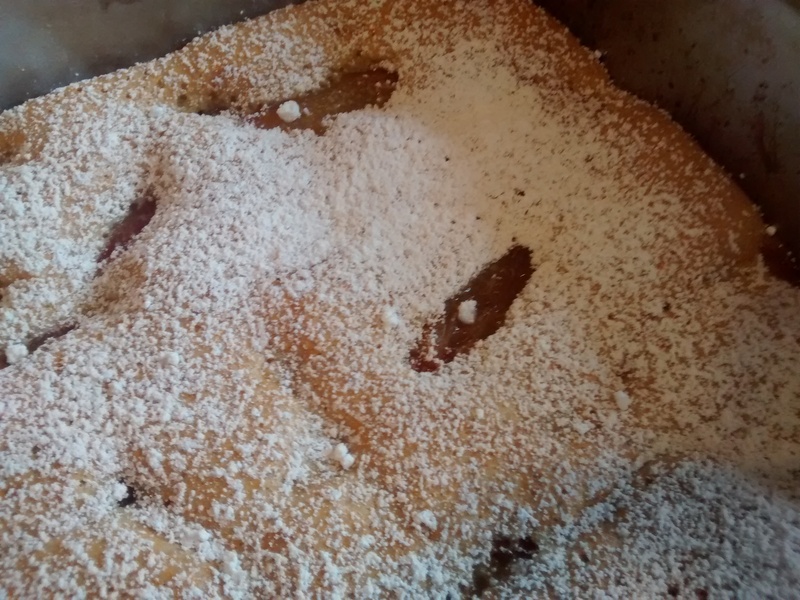 Dust with icing sugar when it has cooled slightly. Tea plates are Counterpoint (1973 – 1987) by Royal Doulton. 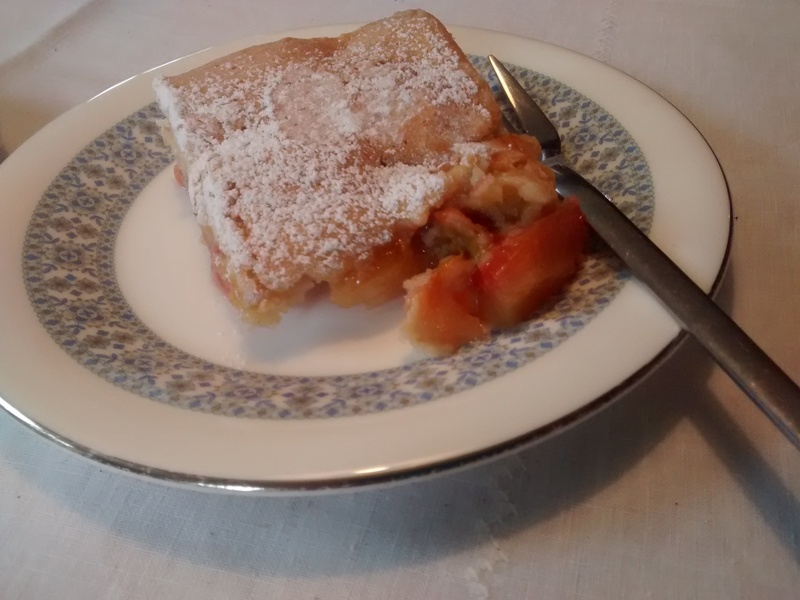 If you have any cake left, it is better not to cover it with too airtight a cover as it will go soggy. 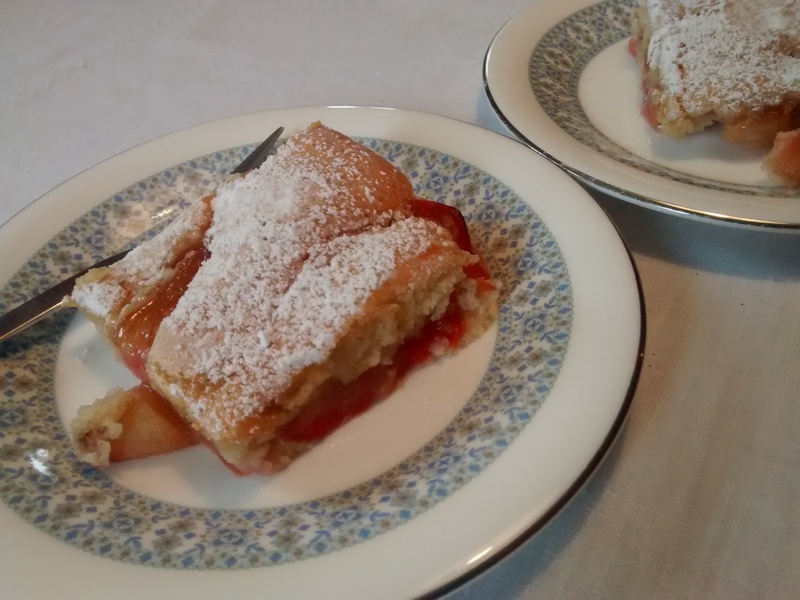 In Poland the plums are often ones called węgierki which means Hungarian. I believe in America they are called Italian plums, they are dark but sweeter than damsons. I have not seem them here.